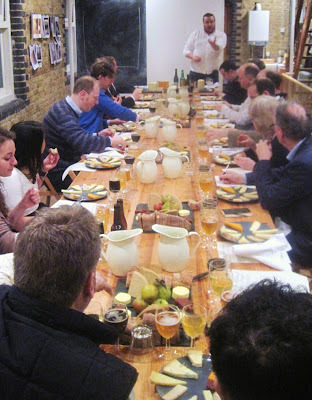 The Cheese Chap: A Neal's Yard tasting: save the cheeses! It's not just whales that need saving. Certain cheeses are on the brink of extinction and risk being lost forever if we aren't careful. 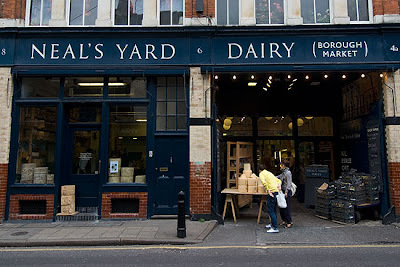 That was the premise of Neal's Yard's Endangered Cheese Traditions event last month, which was billed as a cheese tasting, but was also a lesson in how cultural, economic and social changes are threatening to wipe out some traditional cheeses. There was even a discussion about transhumant lifestyles. Don't worry, I had no idea what a transhumant lifestyle was either until our host Andrew Nielsen explained it to us (more on that later). Nielsen is a great bear of an Australian, who gave up a career in advertising several years ago to become a student of the 'fermentative arts'. He first became a cheesemonger at Neal's Yard, before moving to Burgundy to set up his own vineyard called Le Grappin. He's also an amateur brewer and dabbler in cider. “Anything a little bit funky,” is how he put it. Nielsen picked a good company at the start of his 'funky' odyssey. 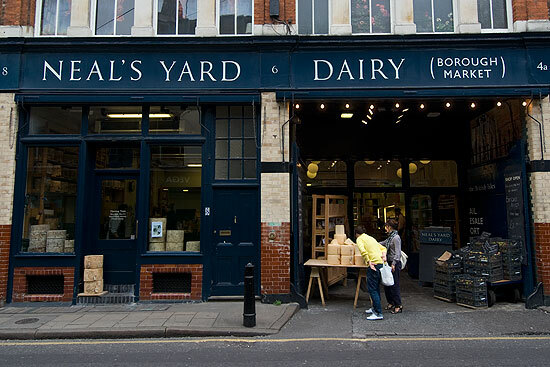 Neal's Yard Dairy is one of Britain's great cheesemongers, specialising in British and Irish cheeses and working closely with small farmhouse producers. 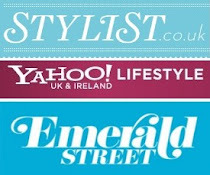 Set up by Randolph Hodgson in 1979, the company has two shops, one in Covent Garden and one in Borough Market. The Borough shop is housed in a lovely high-ceilinged, glazed-brick building on the edge of the market, which long ago was a stables for horses bringing Kentish hops to the huge breweries that used to line the Thames. The tasting was held upstairs in what would have been the hay loft. Abbaye de Tamie – made in the Haute Savoie, France, with unpasteurised cows' milk and matured by Herve Mons. Stichelton – Made by Joe Schneider at the Welbeck Estate in Nottinghamshire to a Stilton recipe, but using unpasteurised milk (so it's not allowed to be called Stilton. The lethal drinks combo, from left to right, was: Saison Dupont Belgian beer, Asturian Llagar Herminio cider, Arenae Malvasia de Colares wine from Portugal, and Kernel Brewery porter. All the cheeses and the drinks are on the brink of extinction with just a handful of producers still making them. You might argue that there are loads of companies making Red Leicester in the UK, but Nielsen's definition of a 'real' cheese is one made in a traditional farmhouse way (eg, by small producers with their own herd using raw milk). Taking that definition, real Red Leicester actually became extinct during the second world war when farms were forced to sell their milk to the government and large-scale factory production took over. That was until it was revived in 1995 when Sparkenhoe was set up. Other cheeses are on the edge because they are such hard work to make. The Salers du Burons requires the cheesemaker to live high in the mountain for months on end as the cows move further up the slopes. This is the transhumant lifetsyle, I mentioned earlier, but people just don't want to live that way any more. “If you're an 18 year old French boy, you want to be going to discos, not living up a mountain with a load of cows,” said Nielsen. The Pecorino de Fossa is struggling for similar reasons. It had a lot of meaty flavours going on and quite an acidic bite. The cheese has been made up in the hills around Umbria for centuries where it is covered in herbs and buried it in hay for several months. It's such back-breaking, labour intensive work that there are only two producers left. Some of this might sound a bit worthy, but the evening was actually great fun mainly because Nielsen was such a knowledgeable and entertaining speaker. For most of the night he was a blur of energy, scribbling on flip charts and holding up photos, only stopping to take a few sips of beer. Like all true curd nerds, he got particularly excited explaining the science of coagulation (look at the love in this picture). The next morning, I tried to work out which cheeses I would personally fight to save. The world would be a poorer place without Cotherstone, Sparkenhoe and Stichelton. I also liked the Beaufort and Abbaye de Tamie (which is very similar to Reblochon), but I could definitely live without the Pecorino, Salers and Bleu de Termignon. They were just too 'funky' for me. Sometimes cheeses go to the great monger in the sky for a good reason. Endangered Cheese Traditions is one of many different tastings run by Neal's Yard. They all last about two hours and cost £50. Encouraging (and sad) to see one of my favourite local ones up there Patrick - Cotherstone. A good read, ta! Hey Gareth! Cotherstone was my favourite of the night. 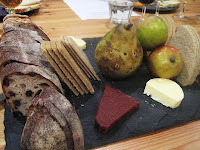 Had an amazing two tone flavour with a crumbly lemony centre andn unctuous mushroomy layer just under the rind. Would love to knw more about them, but there is no website!